This is a Republic, not a Democracy. Let's keep it that way! Ron Paul wins Southern Republican Leadership Conference Straw Poll. 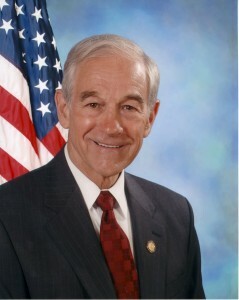 So now Ron Paul has won both the CPAC and SRLC straw polls and has his sights on the IOWA straw poll in August. Thank you for contacting me about your support for the Federal Reserve Transparency Act of 2011 (S. 202). I appreciate hearing from you. As you know, Senator Rand Paul (R-KY) introduced S. 202 on January 26, 2011. This measure would require a full audit of the Board of Governors of the Federal Reserve System and the Federal Reserve banks by the Comptroller General of the United States before the end of 2012. As someone who has been critical of some of the Federal Reserve’s actions, I value your input on ways to provide additional scrutiny on our nation’s central bank. Currently, S. 202 is pending before the Senate Committee on Banking, Housing, and Urban Affairs. Please be assured that I will keep your thoughts in mind as Congress continues to review this legislation. Thank you again for your correspondence. Please do not hesitate to contact me in the future if I can be of assistance. I agree that the Federal Reserve is screwing the American people left and right but since my constituents mean almost nothing to me I shall have to wait to see what my leadership directs me to do and how much money I can make from those parties interested. Please feel free to voice your opinion anytime as recent budget cuts have resulted in a cutback in toilet paper and it is nice to have such correspondences on hand just in case. Is Ron Paul Electable? I keep hearing this question. I don’t think there has been a politician in my lifetime with the degree of consistency this man has. How brave is he? Does he ever shirk his duty to defend the constitution from enemies both foreign and domestic? Every chance he has to take the easy way out he refuses. He says the unpopular thing when it needs to be said. He simple knows right from wrong and does the right thing as he knows it. Now, I can answer the question. Is Ron Paul electable? Of course Ron Paul is electable but that is the wrong question. The question that needs to be asked is “Who is the best man for the United States of America right now?” That’s the guy you need to vote for. If you know the answer to that question, you should write his name in if he is not on the ballot. That’s your duty. Who give’s a damn if the guy you voted for is not elected? Did you vote for the best guy? Did you do, as Ron Paul always does, the right thing for the sake of being right? Electability doesn’t even enter the equation as far as I am concerned. If Americans would just do what is right and not worry about how many other people agree, you might find that those pundits that tell you that a certain candidate can’t win are wrong. NPV wants the President to be elected by a simple majority of all American voters. The National Popular Vote movement is a radically dangerous ploy to side-step an Amendment process that would most definitely fail in favor of individual state battles with simple majority votes. It is much easier for NPV to convince a handful of states to combine or block together their electoral votes then it would be to get the nation as a whole to sign on to the idea that the President should be elected by popular vote. NPV wants to get the President elected by a simple majority of all American voters by convincing enough states to agree to cast their electoral votes for the winner of the popular vote regardless of the will of the people within their state. In other words, they don’t mind if you cast a vote, they just want to be able to ignore it. Now, every state that signs onto this agreement is upsetting the influence of some of the lesser states with regard to the presidential election. There are 538 total electoral votes. The winner requires a majority or 270 votes. If they can obtain enough states to block 270 votes, they defacto determine that the winner of the popular vote will win the election. Even if they fall short of their goal of at least 270 votes. Each state that jumps on board increases the likely hood that their influence will be sufficient to guarantee the popular vote winner gets the presidency. So, what is so bad about electing the president by popular vote? Like it or not, our nation is comprised of 50 separate sovereign entities called states. They created the Federal government for the purpose of maintaining peace among the states and providing a unified diplomacy abroad. The presidential position is, foremost, a diplomatic one. Its role is mainly in representing the interests of the several states. The same is true of the Senate, where they were to represent the State interests with regard to legislation and treaties. In 1913, the election of the Senate was stripped of state influence and converted to popular vote. This alienated the states from the federal government. Now in 2011, we are seeing the NPV pushing hard to remove the States’ influence on the office of the President. Remember… The title is President of “The United States”. It is not Czar. It is not Premiere. It is not Emperor. It is not Dictator. It is not Prime Minister. All of these titles indicate a man representing the nation as a whole or a national governing body. Our presidency was designed to represent the states unified when dealing with foreign powers. What’s this College of Electors all about anyway? The Electoral College is foremost the embodiment of “The Great Compromise” which broke the impasse of our original Constitutional Convention. There was much jealousy among the states at that time. The larger states wanted representation based on population. The smaller states wanted equal representation. They both got their way. Then again, they both gave up something. The House was organized along population. The Senate was organized on equal representation. The primary duties of each were divided. Domestic issues involving expenditures were to be mainly handled in the House with concurrency of the Senate. The foreign policy issues were handled mainly in the Senate with the President leading the negotiations with foreign powers. This why we have 538 Electoral votes. 1 vote for each house member, one vote for each Senator. The election of the president has as much or more to do with the will of the individual States as it does with the will of the People. The states are to act as another layer of checks and balances in a federal system. The people should be able to rely upon the states to remedy abuses of federal power. Many programs that are run from Washington, DC are unconstitutional and should be handled at the state level or abolished entirely. This is important because competition among the 50 states should act as a barometer to determine which programs are effective and how they are best implemented. Competition for citizens and businesses should be the determining factor. It is the best way to evaluate how well states are run. This migration of people also affects the national influence a given state would have upon the general government. NPV threatens to alienate states completely from the federal system and it leads the United Sates further towards pure democracy and dictatorship. In conjunction with the new War Powers being offered to the President it is a dangerous step toward the conversion of our Republic into an Empire. Here is a quick look at what the NPV program would do to the election of the president. The 11 states in the yellow box below hold enough votes to determine the presidency. 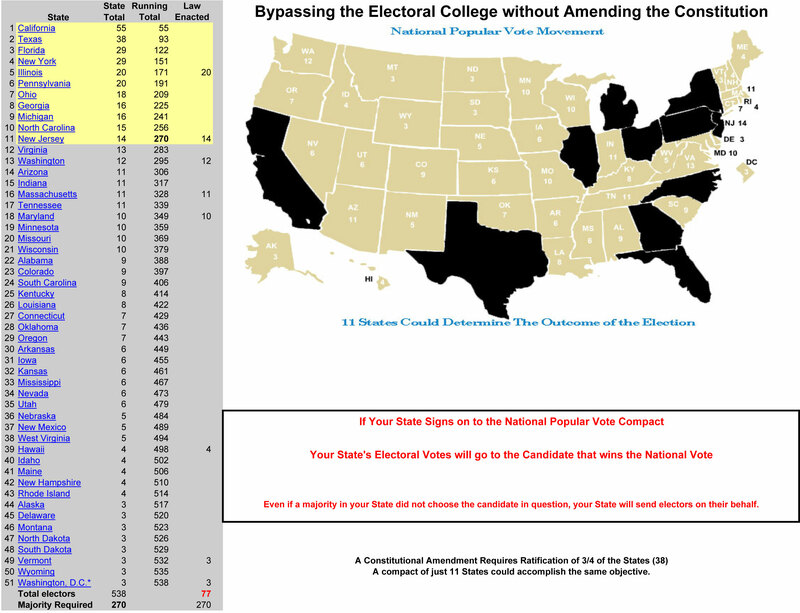 If NPV has its way, as few as 11 states out of 50 would determine the presidency.